What I am going to share with you in this article, I have shared with many Christians who thought they understood bible prophecy. From so called Doctors of Theology to the simply inquisitive, they all recoiled in what the prophets called “astonishment”! Their Christ-returning-any-day concepts were shattered. This proclamation of the angels, I do believe! As a matter of fact, in the new Jerusalem of Revelation chapter 21, it states: “…God himself shall be with them, and be their God.” Vs.3b. The God who will walk amongst us, on this earth, is Jesus. This glorious 110th Psalm makes is perfectly clear that Christ will symbolically “sit” on the right hand (the power of God) in the heavenly “until” his enemies are made His footstool, in other words, conquered. And take notice; it does not say that all His enemies will be saved. Many will have to be crushed by Zion, the Covenant Nations. Note: If I just lost you, I encourage you to get to the Truth In History website and get informed. Now before we look at several affirmations of this prophecy in the New Testament, let me ask you the same question I ask the brethren who are contemplating, for the first time, this theology-shaking theme. How can futurist Bible prophecy teachers (current 21st century speculators) try to tell us that we could have a rapture any day, then the Antichrist will appear for the seven year tribulation period? Wait a minute! Didn’t we just read that Christ will sit until his enemies are made His foot stool? So you’re trying to tell me that Christ will leave the throne, descend to the earth and rapture His saints, then the horrific “enemy” antichrist will arise? Hey, just a fun and holy fact of scripture: Remember, Christ is the head of His body, the church. We have the feet. You mean that these hostile enemies will be our foot stool? Hang in there. I’m just getting warmed up! Our first witness as to the importance of David’s prophecy will be our Lord Jesus Christ. He was addressing the question of David’s son. Christ’s vindication of this prophecy, relating to His future glory, is probably why the apostles were so adamant when quoting it on multiple occasions. The common people heard the Lord gladly. So be it again that soon the common people will hear the truth of this and gladly perceive its relevance in understanding the growth principle of the kingdom of God! Now we turn to the apostles. Guess what is proclaimed by Peter at the opening volley of the New Testament church on the day of Pentecost? The first New Testament apostolic sermon included this admonition. Peter wanted to make sure that the House of Israel knew that David spoke of Christ. And that this Christ would sit enthroned in power at the right hand of God – until! I assert that few in the House of Israel today know the truth of this passage and its inferences. How sad. Here now we turn to Paul. He expounds on Psalm 110:1 and provides further insight and revelation (to put it mildly). Be assured, few in the ministry comprehend what is revealed here. Again, how sad. When death is destroyed, and not “until,” our God will come and walk amongst men again. Our next witness will be the writer of Hebrews. I ask, could it be any plainer? I want the reader to understand that I have purposely presented this article in what might appear to be a choppy manner. I am not writing for the sake of prose and eloquence. I simply want to present the evidence of scripture. So let us now conclude with some sanctified common sense from the Book of Revelation. Relative to the plan, order and continuum of this magnificent prophecy, the author of the “Horae Apocalypticae,” E.B Elliott, stated, “Accordingly, the three septenaries of Seals, Trumpets and Vials will be interpreted by me as a connected and consecutive series; - the seventh Seal unfolding itself in the seven Trumpet visions, the seventh Trumpet in the seven Vials: and this with no intermission or interruption.” This has come to pass and those of us who know the truth of the great protestant historical school of correct interpretation (Historicism) understand that we are currently somewhere transitioning from the sixth Vial to the seventh. It is in this seventh Vial that all Christ’s enemies are finally subjugated. Babylon falls! Gog and Magog are destroyed! The devil is cast into the lake of fire – forever and ever! And God will wipe away all tears, for the former things have passed away. After these things, the heavens will no longer retain our Lord. He will be walking amongst us – forever! Historicism teaches that Jesus Christ's "unveiling" to the Apostle John, that comprises the Book of Revelation, renders an on-going history of the "church," or "called-out-ones," from the time of John until the Second Advent. Preterism generally attempts to place the fulfillment of all prophecy at the fall of Jerusalem in 70 AD, yet some Preterists look at fulfillment when Pagan Rome fell in 410 AD. Most Preterists are of the Post-Millennial school and believe the "called-out-ones" will eventually, through preaching of the Gospel and power of the Holy Spirit, convert the whole world to Christianity. Because that process could take 100, 1000, or 5000 years, no miscalculations are possible. 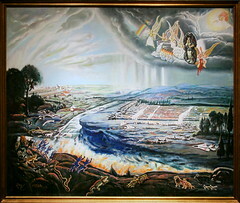 Futurism places events prophesied in Chapters 4 through 19 of the Book of Revelation into the future at the end of the Christian era. The term "Futurism" is often found as a part of the longer title "Dispensational, Pre-Trib Rapture, Futurist." One may use any of the individual designations to refer to the whole, which is often done. By their own words, it is evident that most Futurists are Pre-Trib Rapturists, and most Rapturists are Futurists. Both share their belief in Dispensationalism.